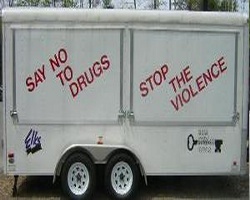 Thanks to a donation from the Grand Lodge and the dedication of the ELKS of New Hampshire, the State Association is the proud owner of our own DRUG AWARENESS TRAILER. This trailer is an 8.5 ft.X 16 ft. (20 ft. including the tongue) vendor style w/ 2 flip up windows on the side, double axl, and electric brakes. It has a 2 5/16 inch tow hitch and it's registered gross weight is 7000 lb. The electricity to the trailers interior is supplied using a typical 110 volt extension cord and has a gas generator for use where there is no electricity. This trailer is available for use by any lodge at a Lodge or Community function. All that needs to be done is fill out the request form to schedule the trailer, and then coordinate to pick up and return the trailer after your use. 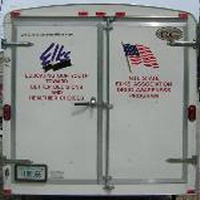 Information and Q&A on Elroy the Elk "click Here"
The Drug Awareness trailer will be picked up and returned between events and stored off season at the Franklin Elks Lodge in Franklin, NH. This hard hitting letter comes to us from a grieving mother in NJ, but it could just as well be from a mother in NH. If you have not yet found interest in what is happening across our country due to our liberal attitude toward drugs (including marijuana), I suggest you start paying attention. Gateway Drug- Fact or Fiction? Marijuana is the most consistent gateway drug. More hard-drug users can link their first drug days to this substance. Young users are three to five times more likely to eventually move on to harder drugs. One study by The Center on Addiction and Substance Abuse at Columbia University showed that adolescents who used marijuana were 85 times more likely to use cocaine than adolescents who abstained. The same study’s results showed that children who smoked it before they turned 15 years old would have a much greater chance of going on to harder drugs. The theory of gateway drugs is simple and logical. If you use light drugs at a younger age, you are more likely to make use of the hard drugs later on in life. Do you want this in NH? EDITORIAL: The president of pot "click here for full story"
The stigma of addled stupidity goes up in smoke President Obama says smoking pot is no big deal. Not every man who has lived at 1600 Pennsylvania Avenue has been a paragon of virtue, nor is perfection expected there (or anywhere else). But it's jarring when the president of the United States plays apologist for vice. In an interview with The New Yorker magazine, Mr. Obama expressed indifference to the mainstreaming of marijuana in Colorado and Washington, and the inroads toward legalization pot has made in other states. "As has been well documented," he told the magazine, "I smoked pot as a kid, and I view it as a bad habit and a vice, not very different from the cigarettes that I smoked as a young person up through a big chunk of my adult life. I don't think it is more dangerous than alcohol." Marijuana is an analgesic that produces euphoria - not exactly the mental state that compels a user to get off his duff and accomplish his life's goals. Today's weed is not your father's reefer. The modern variety is genetically modified and contains a potency that has nearly tripled over the past two decades. The president's own White House Office of Drug Control Policy says so. The new "Rocky Mountain high" is much loftier than the president may remember from his younger days. "He's living in the past," says John P. Walters, the drug czar in the George W. Bush administration. Mr. Walters observes that heavy use of ganja typically reduces a person's IQ by 7 points. A new federal study finds that 6.5 percent of high school seniors get stoned daily. That's a brain drain the nation can't afford. Mr. Obama is equally unfazed by the implications of transforming America into a stoner nation. Out-of-state buyers loading up grass to take home in places where the prohibition of pot is still enforced, a spike in the number of children winding up in the emergency room after ingesting their parents' marijuana-laced food, and a jump in auto fatalities resulting from THC-impaired driving have followed legalization. Americans love to root for the rebel, but the president who gives a free pass to dope is not a freedom fighter. Mr. Obama is comfortable enabling his NSA spies to watch Americans playing a game of Angry Birds on their iPhone, read through every titillating text message and browse through family photos. He isn't working to get government to leave people alone, which may be why pollsters find it increasingly difficult to uncover an American who says United States is headed in "the right direction." By arguing that regular ganja use is merely "a bad habit," the president has displayed the addled thinking for which potheads are known, more evidence that it's wise to get medical advice from a physician, not a politician. "Chronic marijuana use may alter brain structure, study finds"
Elks Natinal Drug Awareness Press Release "What is Krokodil?" It seems that we were so excited this year to have Mrs. Camarena attend our training that we forgot to include in the thumb drive the Nomination Forms and the Criteria for the Award! You will recall that the excellent Task Force, headed by Gerry Kirkland and Lennie Bucci, provided you with the complete list of DEA contact individuals to make it much easier to locate a nominee in your State! You are not required to use their input, but if you are experiencing difficulties in getting Lodges in your State to participate…why not contact them? If Mrs. Camarena did not give you enough reason to participate in this Award process, then you better see a heart specialist! All kidding aside, folks, this is a no-brainer and a win-win situation for you; your State; the Elks Organization and America! Attached you will find the necessary forms to submit a nominee. The first form is for the Lodge to fill out; the second form is for you to fill out. Keep track of the deadlines and stay on top of them. The last attachment is the criteria for submitting a nominee. Let's honor the memory of "Kiki" and have as many States possible submit an application. As always, thanks for what you do. 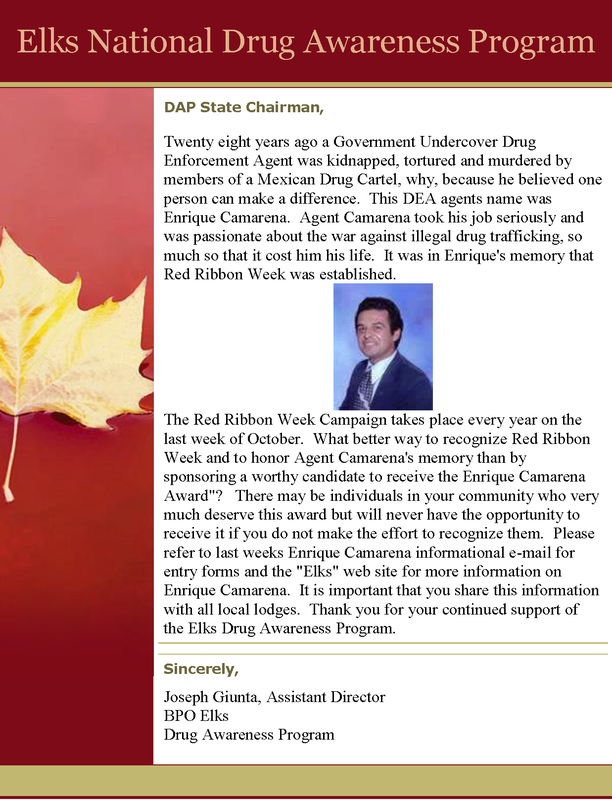 Here are the Registration forms for submitting for the ENRIQUE S. CAMARENA AWARD CRITERIA for State, Lodge levels Click on the links below. Inquring Minds have the NEED to Know the TRUTH!!!! Another example of what we are up against. Following information provided by one of our coalition partners. The Drug Policy Alliance is funded by George Soros, through his "Open Society." Their aim is to legalize all drugs. Unfortunately, they and their millions of dollars, are reaching too many of our kids and too many uninformed adults. Our work is really cut out for us. The Weed Blog reported today that the Drug Policy Alliance has produced a new video that will be aired during the premiere of the final season of AMCs runaway hit show Breaking Bad (about a high school science teacher who becomes a meth cook). The video is part of DPA's efforts to legalize ALL drugs. The video link is included below. National pro-drug organizations like DPA and the Marijuana Policy Project are spending millions to convince voters and politicians that we should surrender to the drug culture. If these organizations were truly concerned about eliminating the harms of drug use, they would use their wealth to educate and motivate people to abstain from drugs instead of normalizing drug use to the detriment of our children, families, communities, and nation. A majority of our NH house members have been in favor of medi-pot for quite some time, but our NH senate was opposed; however, because the bill became more restrictive over the last couple of years our senate weakened and became more receptive to the idea, fortunately our last Governor was opposed to medi-pot and vetoed bills twice. Our new governor ran on a platform of being receptive to a medi-pot bill, so it is no surprise that yesterday she signed a bill to allow people with critical illnesses to posses up to two ounces of pot for therapeutic use. As far as I'm concerned any of these bills that pass are bad news; however, if there is any good side to this story it is that amendments were passed which helped to make the bill quite restrictive. Only a hand full of regulated and licensed dispensaries will be allowed to disperse the pot and NO home grown will be allowed. One other thing, because of their debate about whether or not pot is medicine, the bill got renamed from the "medical marijuana" bill to the "therapeutic marijuana" bill. We (the NH State Elks) have spent many hours fighting all of these NH drug friendly bills and should be very disappointed with medi-pot passing, but we should also feel gratified that we have held off the passing of the decriminalization and legalization bills. I thank each and every one of you for your help and support in this effort. I will be looking for your continued support, because as you know, the efforts to pass these bills will continue. (Reuters) - U.S. authorities carried out their biggest sweep against designer synthetic drugs on Wednesday, cracking down on potentially dangerous herbal blends marketed to young people, the Drug Enforcement Administration said. Law enforcement officers carried out more than 150 arrest warrants and nearly 375 search warrants in 35 U.S. states and five countries, the DEA said. More than 770 pounds (350 kg) of synthetic drugs have been seized in the last three days, it said. DEA officials told a news conference that colorfully packaged drugs with such names as "Rush," "Spice" and "Mister Happy" were being targeted at teenagers and young adults through stores and street sales. "It's specifically marketed for the most vulnerable part of our society," said James Capra, the DEA's chief of operations. Millions of dollars from the sale of the drugs has been traced back to countries in the Middle East and elsewhere, he said. He declined to link the synthetic drugs to anti-American extremists in the Middle East but said they had relied on sales of illicit drugs as a source of funds in the past. Designer synthetic drugs are often marketed as herbal incense, bath salts, jewelry cleaner or plant food. They are made up of plant material that has been infused with psychoactive compounds that mimic THC, the active ingredient of marijuana, the DEA said. Abuse of the drugs can lead to seizures, vomiting, loss of consciousness and overdose deaths, the DEA said in a statement. The number of emergency room visits associated with the drugs reached 28,531 in 2011, more than twice the number the year before, it said. Derek Maltz, special agent in charge of the DEA's special operations division, said the source of the synthetic drugs was Asia, especially India and China. 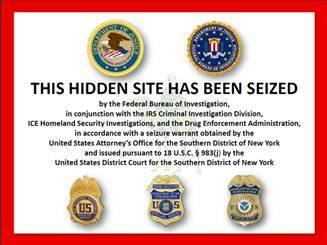 Law enforcement officers also took part in operations in Canada, Panama, Barbados and Australia, the DEA statement said. Since the agency's campaign against designer synthetic drugs began in December 2012, more than 75 arrests have been made and nearly $15 million in cash and assets seized, it said. "Why We Need A Revolution DFA Exposes Marijuana--the Harm to Youth 9-18-12"
LA has finally had enough with these pot "clinics" bans marijuana shops - they have had it! the Los Angeles City Council banned them Tuesday until the state's highest court weighs in. Last week, Oregon became the third state that will vote this November on a ballot measure to legalize marijuana, joining Colorado and Washington. "Legalization is unprecedented - not even the Netherlands has done it - it is entirely possible it will happen this year,"
said Jonathan Caulkins, co-author of "Marijuana Legalization: What Everyone Needs to Know." Click on link for full story. In case you haven't heard, the Feds have made K-2 / Spice illegal. Please visit the link below for more information. Town of Franklin, NH Ordinace regarding the sale and possession of The synthetic drug K2 & Spice. From the Deep South to California, emergency calls are being reported over-exposure to the stimulants the powders often contain: mephedrone and methylenedioxypyrovalerone, also known as MDPV. Meth is Making a Comeback!! Please visit http://www.justice.gov/dea/index.htm for location information regarding the April 30th Prescription Drug Take Back Program. As you can see below, the DEA was very successful with the first ever Prescription Drug Take Back Day by receiving over 242,000 lb. of prescription drugs to be disposed of properly; which, will keep them out of the hands of our children. Just go to the site, click "location near you" then put NH in the locator and hit search; all NH locations will appear. Some information has come to my attention that I thought might interest you. The Montana senate passed HB 161, a bill to REPEAL the states current "medical marijuana" program, by a 28-22 vote. The bill is now on its way to the Governor. I'm confident that the reversal of the initial vote is based on problems that have arisen since it's implementation. A NO vote on the proposed NH "medical marijuana" bill would save New Hampshire from having to experiencing unnecessary hardship.Attached you will find some very informative posters that address some drug related questions and issues. *Frank Mello Jr., PER, PDD, PSP 24 Wellington Dr.
*Larry Benson, PER, 150 Far Hill Rd. *Micheal Norway, PER, PDD 22 Watson St.